Here are my thoughts on all of Wisconsin’s prospects. Obviously as a senior Russell Wilson would constitute an offensive prospect, but I obviously couldn’t watch film of him on Wisconsin from 2010 because he was on NC State at the time. I have high expectations for Wilson and the rest of Wisconsin’s team next year, and if you want to read about the impact I think Wilson will have on Wisconsin feel free to read it here. Otherwise, enjoy the read for these prospects! I watched a ton of film for these, so they should be pretty thorough. Montee Ball, RB, Wisconsin: Ball was obviously extremely effective for Wisconsin last year and he should be the featured back in their offense next year and figures to continue his incredible success that he experienced after John Clay’s injury last season. Ball is a power back in a similar mold to Clay, just without the same mammoth size. He has a similar running style though he isn’t as likely to run over defenders as Clay was. He can run through contact and break arm tackles, but I haven’t seen him bowl defenders over like everyone saw Clay do on a regular basis in the games I watched, though they were from earlier in the season. He seems to have about 4.55 speed to me, which is solid for a power back, but like Clay I don’t think he has much in the way of burst and quickness. He seems to run at more or less one speed on toss or stretch plays, not showing much of a higher gear when he has time to accelerate. He doesn’t quite have the speed to get the edge, but he is a very effective between the tackles runner. Shows the willingness to put his head down and get the tough yards, and showed good vision to find cut-back lanes, etc. He consistently falls forward also which illustrates his impressive leg drive. He also flashed ability in pass protection as he picked up blitzes with effective blocks multiple times while I was watching him. He also demonstrated pretty soft hands out of the backfield. Overall I like Ball as a prospect, but I’m not sure he’s much more than a mid-round guy at this point. I think James White is one of the most talented players Wisconsin has had in years, and is poised to be one of the best players in the Big-10 in the next year or two. 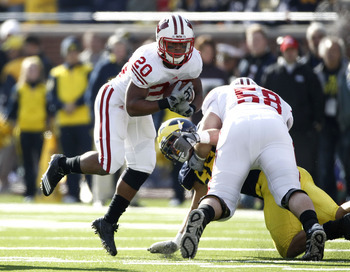 James White, RB, Wisconsin: First things first, White is very fast. He definitely has the speed to get the edge and demonstrated impressive quickness every time I saw him get the ball. He shows pretty good vision though a couple times he missed cut-back lanes when running between the tackles. Those were in the earlier games though, and he seemed to get better and better as the season progressed. When he is in the open field he has a great feel as a runner and is so quick and fast that it is hard to get him down one on one, especially if he can get you off balance with a cut/spin move. He has good hands out of the backfield and should be utilized as a receiver more this year because of his speed and potential to get sizeable gains on screen passes. He also flashes some ability as a pass blocker, utilizing a couple cut blocks to take out blitzing players. He did miss an assignment or two when he was in, so he still needs to improve in this area. He reminds me a lot of Warrick Dunn in terms of his size, quickness, speed, hands and at times his vision. We’ll see if that comparison holds any water as we all watch him this season, but the similarities are uncanny to me at this point. I know White is only a freshman, but he has 1st round written all over him when he eventually leaves in my opinion. Nick Toon, WR, Wisconsin: I have to say I was impressed by Toon. I had seen him play before obviously, since my freshman year actually, and I knew he had a tendency to drop catchable balls at times. That’s usually a red flag for me, because it’s pretty natural to expect a wide receiver to catch the ball when he’s thrown to, or else what’s the point? So I was skeptical about Toon. But after I was able to watch him and specifically pay attention to him and see what he had to offer I have to say I was pleasantly surprised. He has good size at 6’2”, 215 pounds and you can tell he is strong. He is effective running after the catch and gets tough yards even in the face of contact. He is also quite fast. He has a listed 40 yard dash time of 4.52, but I think he might be closer to 4.48, or at least it looks that way on film. But even more importantly, he has very impressive acceleration and burst which helps him create significant separation. At times his burst looks elite, and while I’m not sure if it is, it is definitely noticeable and noteworthy. He is a good route runner for this reason, and I’m not sure anyone in the country runs a better corner route than he does. He also shows the ability to come down with tough catches, such as balls away from his body or passes in traffic with defenders draped over him. He has good hands and good potential to make tough catches, his problem is with more routine passes. I think it has more to do with lapses in concentration (not paying attention to the ball or trying to turn and run too quickly before the ball is secure) than it does with his actual ability to catch the ball. If he focused intently on the routine passes on curls and quick slant routes he would be able to catch them easily, just like he catches tougher balls. His hands aren’t elite, but they aren’t bad enough that he should drop those catchable balls by any means. So, needless to say, I like Toon’s upside. He isn’t a great run blocker, and doesn’t give a ton of effort in that phase of the game, but he isn’t a liability either. I’ve heard he’s a confident, bordering on cocky guy, but that’s nothing new for the receiver position. I can’t wait to see how he does this season, because if he can get on the same page with Russell Wilson he could absolutely blow his career season averages out of the water. To do that, though, he will need to improve his concentration on routine passes. Let’s hope he does, because I love watching him run routes. Josh Oglesby, OT, Wisconsin: There isn’t much to say about Oglseby other than he clearly disappointed this past season. He got replaced by Ricky Wagner, an offensive tackle I am very high on that is expected to start at LT, and didn’t see much playing time after that. The RT position may be up in the air for Wisconsin so perhaps he will have a shot at regaining his starting spot, but he has very slow feet and is not fundamentally sound, leading to him reaching and losing his balance when blocking, severely limiting his effectiveness. He also doesn’t have the lateral agility or the quick feet to mirror speed rushers which presents a problem when he faces smaller, quicker defenders. I would be surprised if he turned out to be the starter, and even though he has great size I don’t think he will stick in the NFL. He strikes me as a potential CFL player because his size will do more for him at that level of competition. Wagner has NFL upside as a LT in my opinion, and I was very impressed with him even when he had just been inserted into the lineup at RT. Ricky Wagner, OT, Wisconsin: Wagner should be the man to replace Carimi at LT and he is only a junior so he definitely has upside. I was very impressed with his lateral agility, his sound fundamentals, his quick feet and his good hand placement. He doesn’t lean or reach when blocking, he bends at the knees, not at the waist, and he has the athletic ability to get out in front of screens or to cut block defenders effectively. He is very athletic, moves to the second level well, and has good awareness to boot. On top of that he can recover quickly whether he is surprised by a blitzer or if he gets bull-rushed, and he has a strong anchor that he can use to stop the bull rush. He has the total package and I think he might actually have more upside than Carimi as a pass blocker because he will be able to handle speed better than Carimi did. I think Wagner has LT written all over him and may even keep the LT label once he starts getting NFL consideration. I am very much looking forward to seeing him play this season, and I think he will surprise a lot of people once he faces some pass rushers at LT. He should be able to handle whatever the Big-10 can throw at him. There was a rumor going around Wisconsin that he was playing so well that the coaching staff considered moving him to LT last year, even with Carimi firmly entrenched at the position. That speaks volumes about his upside in my opinion. I can’t wait to watch him play more this season as a junior. Kevin Zeitler, OG, Wisconsin: Zeitler is a pretty good guard, but I’m not sure he will go before the 3rd round at this point. He has pretty good size and shows some ability as a drive blocker, has pretty solid leg drive usually, and is an effective combo blocker who has the athleticism to get to the second level. He is a solid puller, but not spectacular and at times will struggle to sustain when blocking on the move. He is athletic enough to cut block effectively which he does well, and he also has a good enough first step to down block effectively, where he gets a good push. He will lean at times I noticed, but overall seems to have solid balance. He can anchor as a pass rusher and seems to be fundamentally sound overall as far as hand placement, etc. I don’t think he’s an elite guard, but he looks like a reliable NFL starter to me, similar to Moffitt in that regard. Peter Konz, C, Wisconsin: Konz was very impressive when I watched him. He will be a junior in 2011 so he has definite upside. He is big and strong enough that he can block a defensive tackle one on one which is a very valuable trait for a center to have. He isn’t a dominant drive blocker but he can drive DT’s one on one at times which is almost like having a third guard on the line instead of a smaller pivot who can’t handle a defensive tackle one on one. It’s a huge advantage for your offensive line, which is one reason I’m high on Konz and another reason why I think he will be in high demand when he enters the NFL Draft this year or next. He is a good athlete and pulls well and he blocks effectively on the move, consistently engaging linebackers on the second level and taking them out of the play. He also has an impressive first step which enables him to snap and step smoothly, and that enables him to down block or wall-off defensive tackles to create seams in the middle of the offensive line with relative ease. He has good feet and strength which helps as well. He will lean into his blocks at times though which leads to balance issues, so he spends some time on the ground which I’m not wild about. He has pretty good awareness but I’m not sure how good his intangibles are, I haven’t seen enough of him to know how much he makes line calls before the snap, etc. He has a lot of upside, but he still has things to improve on. I think he is the 2nd best prospect on Wisconsin’s offensive line behind Wagner. Jacob Pedersen, TE, Wisconsin: I was very pleased with myself for uncovering Pedersen when watching film. His stat line may not blow you away (8 receptions, 132 yards (16.5 yards per reception) and 2 TD’s) but they are pretty impressive for a #3 TE who was playing behind a 2nd round pick who was a very good receiving TE and arguably their best big play receiver in Lance Kendricks. I was not particularly taken with Jake Byrne, a TE who will be a senior in 2011, though he is a pretty good blocker. I expected them to have a receiving TE to help replace Kendricks, and that is where Pedersen comes in. He is fast, similar to Kendricks I would say, has good size, hands and has some quickness to create separation and shows the ability to run effective routes. I don’t think he will be the primary blocking TE like Kendricks was regularly for the Badgers, but should have a similar role to what Kendricks had as a junior with Garrett Graham as the primary TE. He should provide some ability to stretch the field just like Kendricks did and hopefully his hands will be just as reliable. 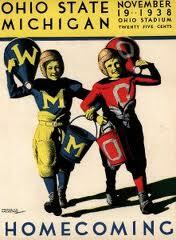 Thanks for reading, and the defensive post should be up later today!